Ralston’s V Series consoles, for electrical and electronic controls, instruments and components, are designed to provide protection against dirt, dust, oils, coolants and water. The V Series consol have a wide range of applications. Their heavy duty construction makes them suitable for control functions in paper and saw mills, lumberyards, on factory floors as well as in food processing facilities. Nevertheless, their attractive design and finished appearance ensures a quality test console for laboratories, research facilities and offices. 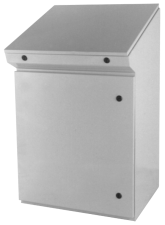 V Series consoles are constructed from 14 ga. hot rolled steel and 14 ga. 304 stainless steel. Continuously welded seams are ground to a smooth finish. The front lower doors are vertical for easy mounting of through door disconnect switches. They come complete with water resistant neoprene gasket and are held closed with flush 1/4 turn latches. The doors have hidden hinges and are mounted flush with each side of the console. Ground studs are standard along with a removable print pocket. Consoles 40” and 48” wide have two doors that rest on a center mullion to ensure water tightness. The sloped control doors have hidden hinges, water resistant neoprene gasket grounding studs, and are held closed with flush 1/4 turn latches. Each enclosure comes complete with a bottom opening for cable access and a removable 12 ga. back panel mounted on 3/8 collar studs. The sides of the Vision console has been equipped with unistrut for reinforced support and as a provision to mount optional side panels. VCB Series consoles are phosphatized and finished inside and out with ANSI/ASA61 Grey powder paint. VCSS Series consoles are made from 304 stainless steel with a #4 brush finish. Inner panels are cold rolled steel painted with high gloss white powder paint. V Series consoles are built to the requirements of NEMA/EEMAC type 12 specifications for use with industrial control equipment in ordinary locations, type 13 for an oil and dust tight enclosure, and type 4,4X as a water tight corrosion resistant enclosure. V Series consoles are CSA certified (File #LR 23608) and UL 508 listed (File #E136838) as a type 4,4X,12,13 enclosure. Custom units of special sizes or with punching can be supplied to order. CAD files are listed by part number. Find the part number in the PDF(s) above. for corrosion resistance, Carbon Steel Enclosures can be used for both outdoor and indoor applications.